Michele Gazit | Lisa Kantor Sings! Last night I had the privilege of sharing a joyful evening of music with a room bursting with humanity! 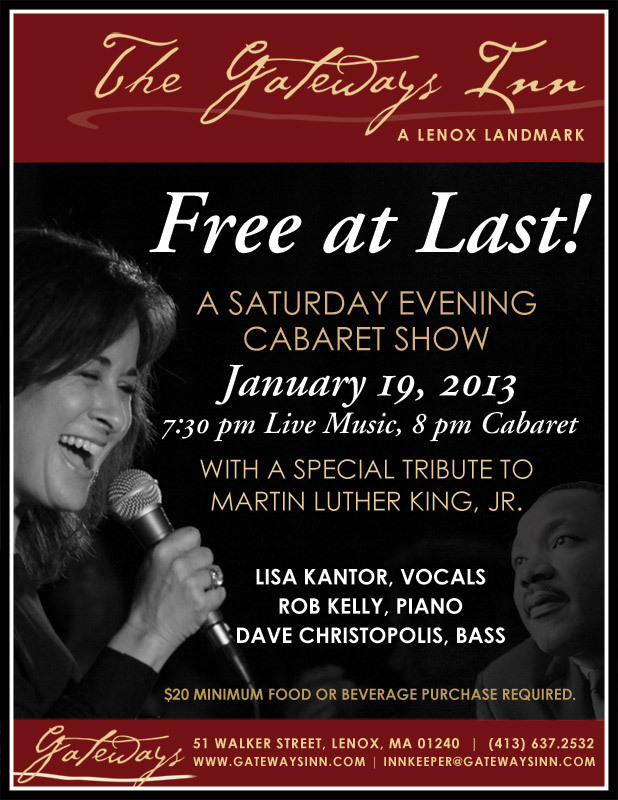 About 70 people joined me at the Gateways Inn in Lenox for “Free At Last!”, a cabaret performance in tribute to the late Dr. Martin Luther King Jr. I was joined by Rob Kelly on Piano and Dave Christopolis on Bass, and together we had the profound pleasure of making music while celebrating our human capacity to consider, reflect upon, and pursue freedom… a uniquely human opportunity, don’t you think? (Can you think of another life form that is able to step outside itself and think about it’s potential for freedom???) And what better way to celebrate than an evening of songs, spoken word, and the ever-resonant words of Dr. King’s “I Have a Dream” speech? We ended the evening together- after numerous jazz standards, ballads, swing tunes, pop songs, show tunes, AND a poem – by singing Amazing Grace. After watching the video today, I realized even more fully how beautiful that moment of community was – and the harmonies knocked my socks off! I am aware, once again, that so many of us long for the power of community. Together, we are elevated in our celebrations and our self-reflection, and through music we access something that exists beyond what words alone can capture. I thank those who joined me last night, as together we opened the door to that “portal to pure joy” that is so incredibly satisfying to me, as a performer. Click here to read responses to this post.